Classifying automobiles used to be so simple. You had cars, for carrying people around, and trucks, for carrying stuff around. At some point, someone decided it would be nice to have a car that could carry both people and more stuff, and so the hatchback and wagon were born. But what if you wanted to carry both people, stuff, and take it off road? Presto! The truck-based sport utility vehicle, or SUV, was just the ticket, accept that it handled and burned gas like a truck. Which brings us to the state of automotive mash-ups we have today. As designers try to maximize benefits by combining various types, it’s hard to know exactly what you’re driving anymore. From crossovers to sports activity vehicles, the boundaries are blurring to the point that old categories such as car, truck, or SUV could soon be useless. Take the Infinity EX35. Derived from the G sports sedan and capturing the same flowing, athletic look, the EX35 is definitely not a traditional, boxy SUV, but it’s not really big enough to be a wagon either. 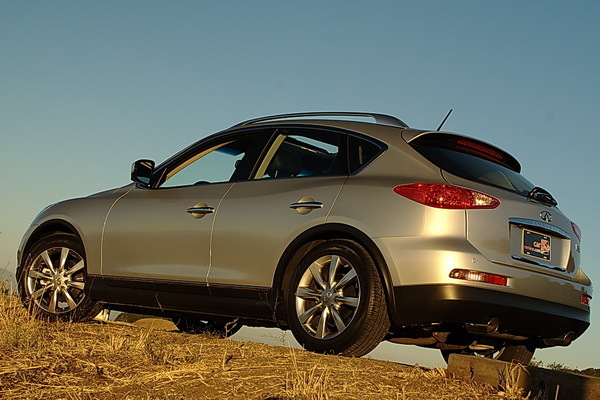 Technically the EX35 competes in the small luxury crossover segment of the market, which is one way of saying that it looks and functions like the cross between a hatchback and a grand touring car. Leaving classification issues aside, the EX35 is a captivating car and a unique new entry in the evolving automotive landscape. Climb into the EX35 and one of the first things you’ll notice is Nissan’s keyless ignition system, which uses an intelligent key fob instead of a traditional key. This is just one of many high-tech gadgets that make the EX35 one of the most technologically sophisticated cars on the road today. Order the technology package and you get a host of advanced features designed to help make driving more safe and effortless. The Around View Monitor uses a series of digital cameras to provide an overhead picture of the car (at first you’ll swear there is a mini-helicopter shooting the footage! ), which makes parking and maneuvering in tight spaces a no-brainer. The Lane Departure Warning System and Lane Departure Prevention System use these same cameras to warn you when you are accidentally drifting from your lane, and even use the ABS and traction control to intervene if needed. The moment you get close to a lane line or if you change lanes without signaling the system makes a beeping noise, which gets annoying rather quickly and we found ourselves turning it off most of the time. Finally, there is the Intelligent Cruise Control, which uses front and rear sonar to automatically adjust your speed based on the cars near you. This system works impressively well, even in heavy traffic. Push the ignition button on the dash and it fires up a 3.5 L V6 engine that produces 297 hp and 253 lb-ft torque. This is the same award-winning engine that is featured across the Nissan line-up in various states of tune, and it doesn’t disappoint here. Acceleration off the line isn’t head-snapping, but once past 3,000 rpm the engine powers the car forward with impressive authority as it eagerly climbs to the redline. Shifting duties in the EX35 are handled by a 5-speed automatic transmission with manual shift mode, downshift rev matching, and sport mode. There were occasions where having a 6th gear would have helped take full advantage of the rev-happy motor, but overall the transmission compliments the engine well. Slide the shift lever into sport mode and it radically changes the shifting algorithm to keep the transmission in the optimal gear for fast driving. It is so good that you’ll find yourself rarely using the manual shift function. The premium luxury class of high performance crossovers is getting crowded. In addition to the crossovers listed above, we now have the Lexus RX 350, Volvo XC60, and Mercedes-Benz GLK 350. There are a new breed of sport-oriented luxury crossovers that are smaller than a mid-size SUV. Because the X3 and LR2 proved to be popular and profitable, other manufacturers decided to jump in with their versions of a premium, sports-oriented, SUV. Now we have the Acura RDX, Mazda CX-7, and EX35 that provide the utility of a SUV along with the near-performance of a sports sedan. Nice review! And it looks like an interesting car. From the review I can’t quite tell where it fits in, though. What other cars would it compare to? I drive a top-of-the-line Outback (a beat up one) and this EX35 sort of reminds me of the new small sport SUVs. Is that right?